One more histogram, possibly of general interest. 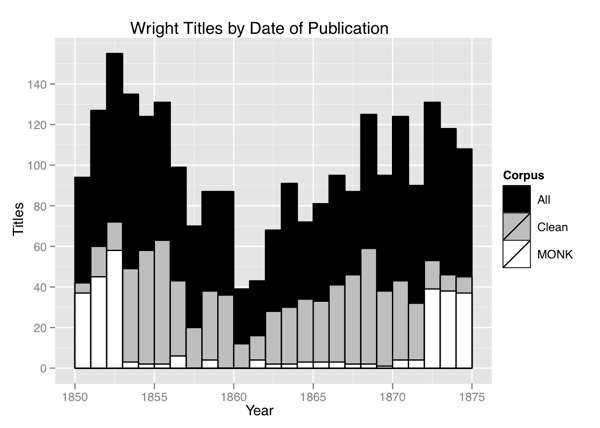 Below is a plot showing the number of literary titles by American authors published in the U.S. each year between 1850 and 1875 (via Lyle Wright’s 1957 bibliography as represented in Indiana’s holdings, black bars) along with the number of those titles held in fully edited form in the Wright American Fiction archive from Indiana and in the MONK project. Note that this isn’t a stacked bar plot; you’re seeing three distinct histograms superimposed on one another. So if you’re looking just at the black bars, you’re seeing a comprehensive survey of American literary production around the Civil War. Publication of literary texts drops off in the run-up to the Civil War and in its early years, then bounces back pretty quickly, even before the war is over. There are about 100 new books each year on average through the period. Two notes for my own purposes. (1.) IU’s coverage of fully edited texts is around 40% of the total period output. That’s pretty good. Just as importantly, it hits that level roughly evenly for each year. No need to worry about serious variations from year to year or about individual years with very low representation (though be careful with, e.g., 1860–61). and (2.) I like what MONK did with its 300-text subset, clustering texts as far on either side of the war as possible. Even if you were only working with MONK, you’d still have a decent chance of picking out ante-/post-bellum features. I guess I do find it a little shocking the production drops off five years before the war starts? Were novelists too busy worrying about the civil war that might or might not break out at any moment to start on their books? 1. The fall-off beginning c. 1856 might not be real. I mean, the numbers are right, but without more context (for earlier and later periods), it’s hard to say if the high totals for 1851-55 are anything other than a fluctuation above the norm that makes a return to the long-run average in 1856-60 look like a more dramatic reduction that it is. After all, there were still c. 85 titles published in 1859, which isn’t way out of line with the period mean. 2. But to the extent that the drop-off is significant, I can think of two or three possible explanations: (a.) There may have been some shift from literature (shown here) to political or non-fiction writing immediately before the war. And/or (b.) publishers (rather than authors) may have been reluctant to invest in leisure reading projects with war on the horizon, bringing down the number of new titles published even if the same number were being composed. And/or (c.) You might be right; maybe authors had better things to do at the time.